The family Avril produces wine in Châteauneuf-du-Pape since the beginning of the 18th century. The present "master of ceremonies", Paul-Vincent is the very talented son of Paul Avril. 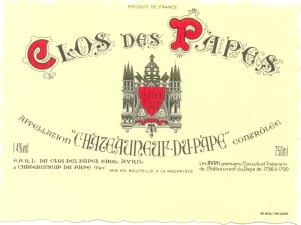 The Clos des Papes is being considered as the reference for the region since the very beginning; a reputation that doesn’t necessary logically meets the reality for all wineries, but in this case is most certainly correct. On top of that Paul Vincent and its parents are known as the most noble and attentive winegrowers of the southern Rhône. Certainly a domain not to be missed by any visitor to the region. Not only for the quality of their wines, but also for the warm reception. The name of the domain originates from the vineyards that were once part from the papal vineyards within the stronghold of the castle of which today only a ruin is left. The 17 other lots have been divided within the appellation Châteauneuf-du-Pape, from the sandy grounds in the South-east and the West till the lime containing rocky undergrounds in the North and Northeast. Paul Avril decreased progressively the quantities of Grenache in its composition so he could use more Syrah and Mourvèdre. These are the three most used grape varieties in addition of muscardin, counoise and vaccarèse, used in much smaller quantities in the final composition of the wine. The winemaking is still according to the traditional manner, and since halfway the 90’s, the Avril’s remove the stones of their red grapes complete, without changing their customary smoothness. 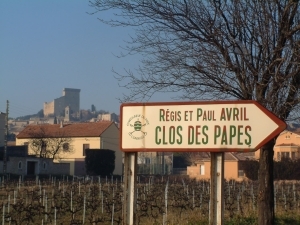 Clos des Papes is only marketed as one red and one white wine, as the Avril’s refuse to make special cuvées. Therefore less qualitative grapes are being sold to négociants. The wines these days are bottled unfiltered, according to the 80’s method, provided that the tannins are not too dominant. 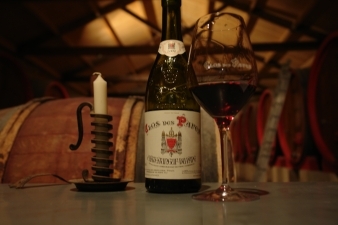 The Clos des Papes became one of the few Châteauneuf-du-Pape wines that can be drunk early with only 5 to 6 year cellar maturation in the best millésimes. On the other hand it will not amaze anybody that this wine has the best potential of ageing of the whole appellation. A wine intended for the passionate lover of Châteauneuf-du-Pape wines.